For use with Brother MFC-J280W, MFC-J430W, MFC-J435W, DCP-J525W, MFC J625DW, DCP-J725DW, DCP-J925DW, MFC-J5910DW, MFC-J6510DW MFC-J6710DW MFC-J6910DW and more printers. These large cartridges each hold up to 80ml of ink and stick out from the front of the printer. The magenta cartridge contains a hook that usually fits inside the door sensor to make the printer think that the door is closed! On some models you may need to manually tape up the sensor. Set-up is fairly easy, but please do not buy if you are not prepared for a little inconvenience during the initial set-up! 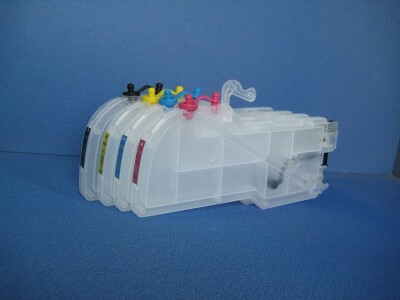 Such users are best buying our smaller refillables that fit inside the printer the same as ordinary cartridges.